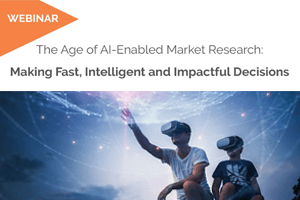 AI enabled market research is a step ahead into a collaborative world wherein it’s not just only about automation; it involves real intelligence and decision making capabilities. AI enabled Market Research will not only follow instructions but also know what it means to marketers. It makes Market Research all the more powerful to look beyond numbers and get a better sense of emotions, attitudes and behavior. It’s all about being smart, knowing your customers and steering ahead in the race. In this webinar, Jitender Bhatia, Director of Data Management System and Ina Nanda, Associate Director of Market Research demonstrate how machine learning (ML) and AI can be integrated with your current research setup to make smart and impactful decisions, along with an industrial example of a leading CPG company being helped by AI- based concept testing.